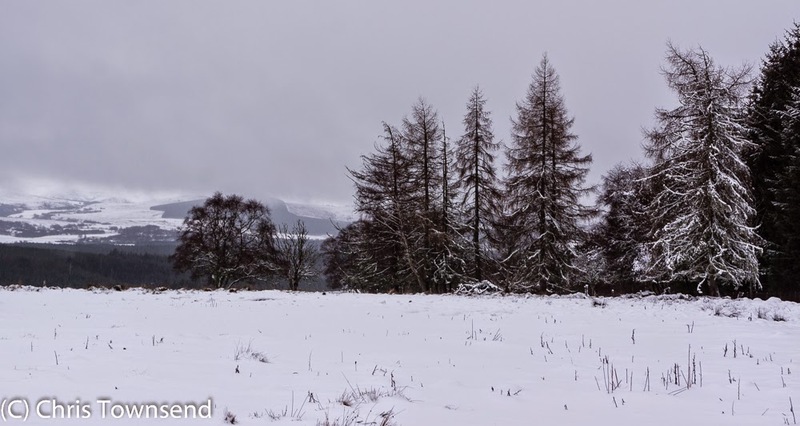 Slowly the snow has built up over the last few days as storms sweep the Highlands. The hills are hidden in racing clouds. Blizzards sweep the fields and woods. This is not the time for the mountains. But it has been the time for skiing from the front door, for the first time in nearly two years as last winter there was never enough snow. Gliding through the fields on my skis I looked out on a grey world with even the dark green of the pines and spruic subdued and dulled by the snow-filled air. Squalls blasted in on sudden bursts of strong wind – sometimes snow, sometimes sleet, always wet, soaking into my clothes. 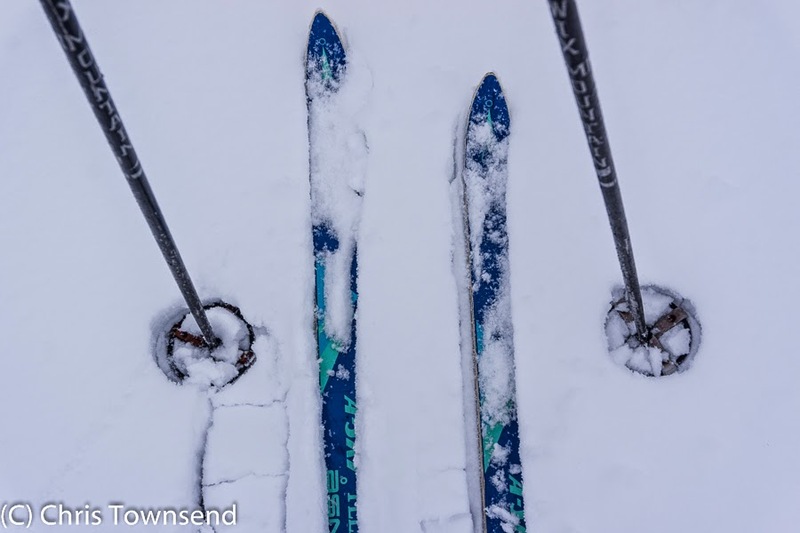 The snow underfoot was wet and heavy too, compressing quickly under my skis to a slick track that made for fast travel. Under trees the snow was thin and sketchy and I quickly learned to stay out in the open, forsaking shelter for easy skiing and less risk of scraping my skis on stones. The fields were full of animal and bird tracks. Fox, squirrel, pheasant, rabbit, lots of rabbit. In places the snow has been scraped off low rises in the rough pasture so the rabbits could feed. They were the only wildlife I saw too, scurrying through the snow. Nothing else moved. Under the snow the ground is soft and wet. 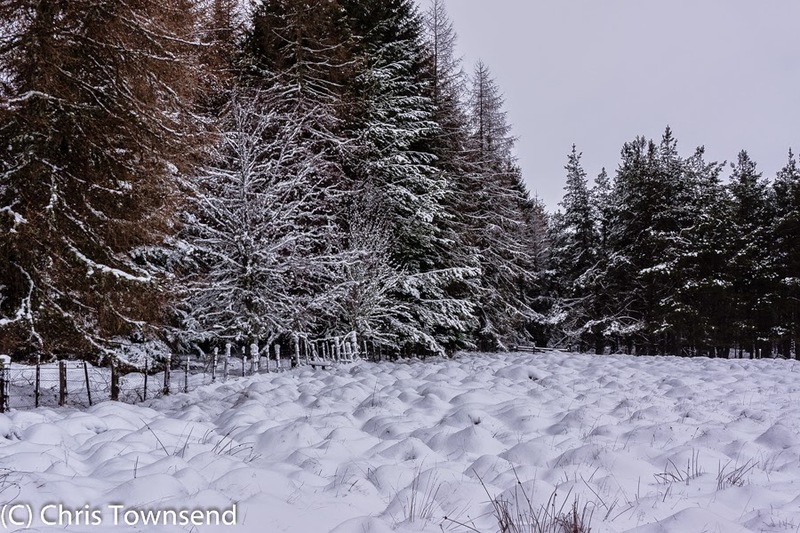 Bare patches under the trees glistened with water and ruts and hollows were grey-brown with half-frozen mush. A slight rise in temperature, as is forecast tonight, and the snow will quickly vanish, especially as rain is also predicted. But then more snow is forecast for tomorrow and the day after with the big storms continuing all week. A ski tour in the mountains will have to wait for calmer weather but it has been good to ski at all and maybe I will be able to do so again soon. Hi Chris, the ski touring sounds like a great way to experience the mountains in winter. What kind of skis do you prefer? Nordic, Telemark, alpine ski touring? Hi Andy, I prefer Nordic/light Telemark. The ones in the picture are a very old pair (1987!) of Asnes A-Skis. They were regarded as wide at the time but now seem very narrow. Hi Chris, thanks for getting back to me. Reading Rattlesnakes & Bald Eagles at the moment (very enjoyable!) and am inspired by your admiration for ski touring. Thought I'd give it a go too and have just joined the Edinburgh Ski Touring Club. First trip at end of the month to Glenshee - wish me luck!